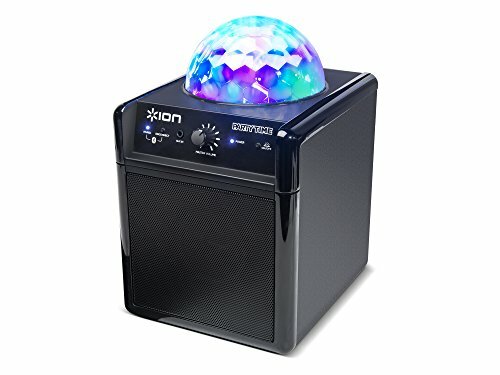 The Party Time speaker from ION Audio combines powerful sound with colorful dance lights in one convenient, portable design. Stream music from any Bluetooth smart device and watch the colorful lights burst into action. Or plug in non-Bluetooth devices with the included 1/8” audio connector. As your music fills the room, the lights pulsate in time with the beat to create instant excitement. You won’t believe such a dazzling effect can come from something so small. Party Time makes a great audio-only solution as well: the dome lights turn on and off at the flip of a switch to enjoy it as a full-range speaker. Easy to carry and built to last, Party Time energizes an entire room in no time. NOTE: For a larger version of this product, check out the 19.4-lb Party Rocker Live. For an even more portable version, try the 0.75-lb Party On.